Google announced last year that it would shut down the company's social network Google+ for consumers but not for G Suite customers in 2019. A privacy issue with the potential to leak user data and "challenges in creating and maintaining a successful Google+" were the reasons that Google provided at the time. Update: Google+ was shutdown on April 2, 2019. The company wanted to shut down Google+ in August 2019 initially but had to expedite the shutdown to April 2019 when it became clear that even more customers were potentially affected by privacy leaks. February 4th, 2019 -- Options to create new Google+ profiles, Google+ pages, communities, or events are disabled. February 4th, 2019 -- Google+ commenting options on Blogger will be removed. early March 2019 -- Additional download options are provided that include author, body, and photos for community posts in public communities. March 7th, 2019 -- Google+ commenting options on other sites will be removed. 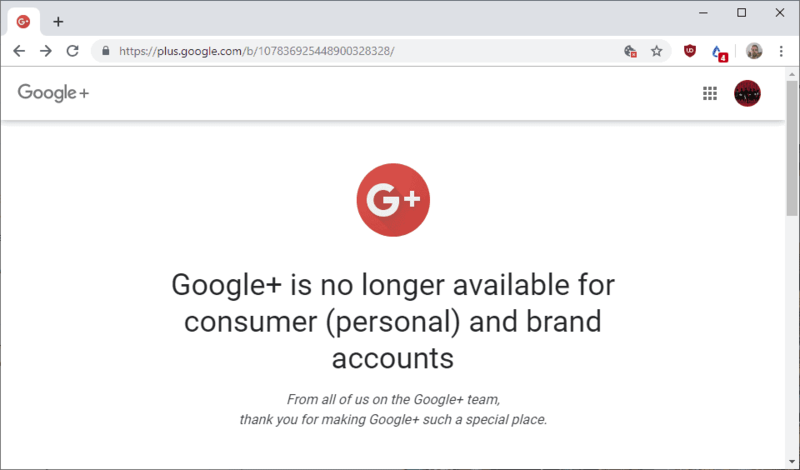 April 2nd, 2019 -- Google+ account and Google+ pages will be shut down. Deletion of content from consumer Google+ accounts starts. Google notes that photos and videos will be deleted in the process, and that the entire process may take months until completion. Users may follow instructions on this help page to download Google+ data prior to the deletion date. Google won't shut down Google+ for G Suite customers and even plans to introduce new features to the Enterprise version. It is clear that Google+ did not perform as well as Google hoped it would; the social network never managed to gain enough traction to establish itself as a Facebook competitor despite Google's attempts to push the service using all its marketing power and some questionable -- some might say unethical -- practices. 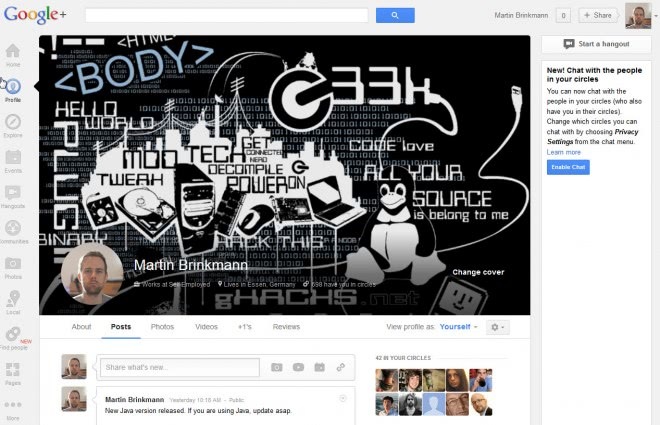 Now You: are you affected by the Google+ shutdown? Google announced last year that it would shut down the company's social network Google+ for consumers but not for G Suite customers. Also keeped my facebook account without any update only for finding old friends. Never used it, I guess not many did. Google’s great at programming, but absolutely terrible at UI. I don’t think more than 1% of people even understood what the hell google+ was supposed to be. After Google introduced Google+, they changed it so that all accounts for Google services, including GMail, became Google+ accounts. They specifically wanted everyone to stop having different accounts for each service, and combined them all into one logon. That’s very probably why you have Google+ accounts that you weren’t aware of.